This week Sen. Flake will be meeting with local stakeholders and constituents throughout Arizona. Last week Sen. Flake voted to confirm Judge Neil Gorsuch to the Supreme Court. He also voted to confirm Elaine Duke to be Deputy Secretary of Homeland Security, and to reinstate a safety exemption for a historic steamboat called the Delta Queen through 2028. 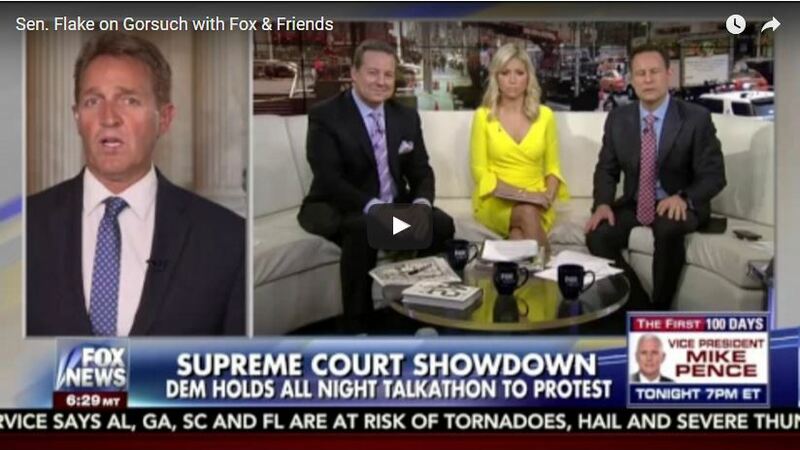 Sen. Flake appeared on Fox & Friends to announce the release of Tax Rackets: Outlandish Loopholes to Lower Tax Liabilities, his latest report exposing some of the most outrageous loopholes that are costing taxpayers billions of dollars. Read more about how you’re getting fleeced here. 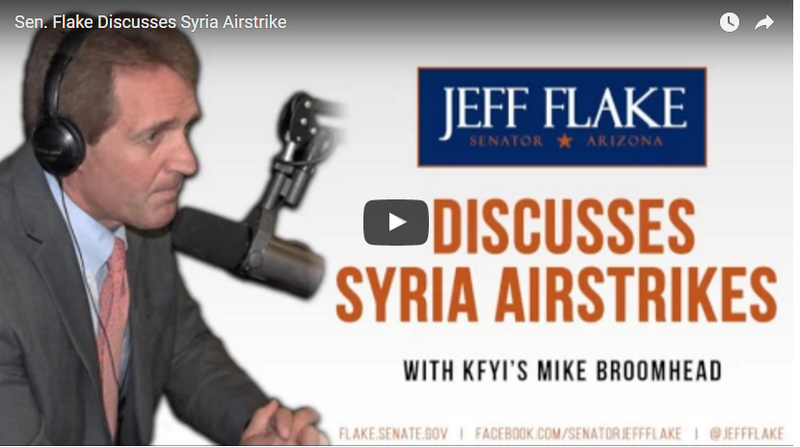 Sen. Flake joined KFYI’s Mike Broomhead to discuss President Trump’s decision to launch missile strikes against a Syrian airbase in response to Syrian President Bashar al-Assad’s suspected chemical weapons attack last week. Listen to the full interview here. Justice: Sen. Flake penned an op-ed in The Daily Caller explaining his votes to prevent partisan filibusters of qualified Supreme Court nominees and to confirm Judge Neil Gorsuch.Read the full op-ed here. Striking Back: The Arizona Republic reports on Sen. Flake’s support for President Trump’s decision to launch a missile strike in response to a suspected chemical weapons attack by Syrian President Bashar al-Assad. Read the full story here. Fleecing Taxpayers: The Daily Caller highlights Sen. Flake’s Tax Rackets: Outlandish Loopholes to Lower Tax Liabilities, his report exposing some of the most outrageous loopholes that are costing taxpayers billions of dollars. Read the full story here. Setting the Record Straight: Sen. Flake explains the benefits of his resolution to preserve internet privacy protections and encourage innovation in an op-ed for the Sierra Vista Herald. Read the full op-ed here. When Losers Win Big: The Washington Times reports on the “gambling loophole” identified by Sen. Flake’s Tax Rackets: Outlandish Loopholes to Lower Tax Liabilities. Read the full story here. Congressman Carl Hayden was the first person to represent the state of Arizona in the U.S. House of Representatives, serving from 1912 to 1927. He would go on to serve seven terms in the United States Senate, becoming one of the longest-serving members of Congress in history. Julia from Tucson asks – At which restaurant was the chimichanga first invented? Bonus Question: How was it invented?